Despite the Swedish economy’s relatively robust recovery from the economic turbulence of recent years, immigrants have persistently high unemployment rates and are concentrated in low-skilled work. To improve its long-term prospects, Sweden faces the challenge of better facilitating new arrivals’ labor market integration, particularly for humanitarian migrants and their families. Concerns about newcomers’ economic prospects have prompted the government to invest heavily in labor market integration, experiment with new approaches to language instruction and training for immigrants, and reorganize its flagship introduction program for new arrivals. The strategies, while innovative and often thoughtfully designed, have been slow in delivering change, and large gaps in employment rates persist between native and foreign-born workers. This report describes how Sweden is trying to overcome labor market integration challenges and analyzes how successful its workforce development and integration policies have been in helping immigrants progress from unskilled or low-skilled work to middle-skilled jobs. 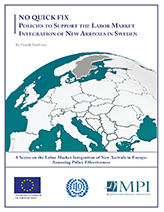 It first discusses the structural conditions of the labor market and how these affect labor market integration, then analyzes policies to support labor market integration (employment services, skills recognition services, language training, and vocational training), and concludes by offering some recommendations.